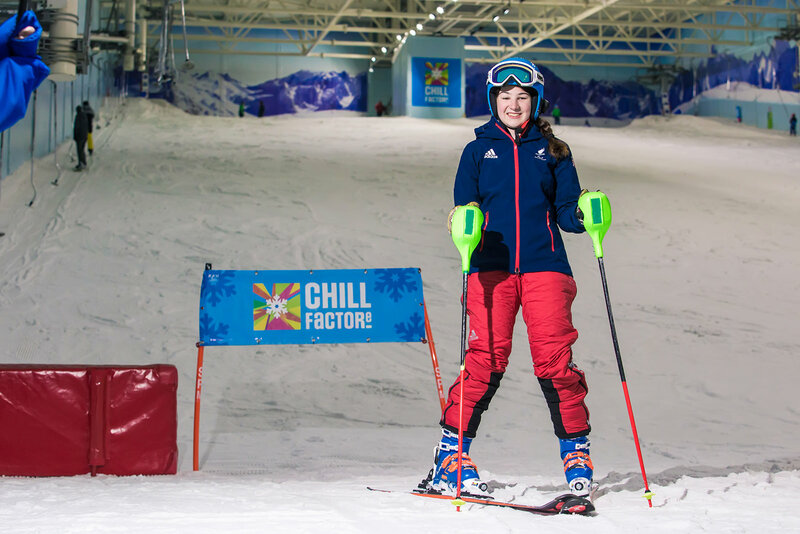 Chill Factore, has launched a Ski Confidence Camp with decorated Paralympian Menna Fitzpatrick, to encourage more beginners to get into snowsports and overcome their fears on the slope. The Confidence Camp has been launched as part of the ‘Don’t Wait, Exhilarate!’ campaign at Chill Factore, designed to inspire beginners to get involved in skiing or snowboarding and consider the benefits of taking ski lessons ahead of peak season. Research by Chill Factore, which investigates the barriers people face in getting into snowsports, has found that a whopping two thirds of people who have never skied or snowboarded but are interested in learning think lack of confidence is a barrier. It’s not only first timers being held back by confidence. The survey also found that 95% of beginner level, 88% of intermediate level and 86% of advanced level skiers and snowboarders say they sometimes or often experience a lack of confidence. According to the research findings, quieter slopes, taking lessons before going on holiday, tips from an instructor and skiing/snowboarding with people of the same ability came out top as most likely to boost confidence amongst beginners and those who are considering learning. For those interested in learning, the biggest factors impacting on their confidence and willingness to learn are worrying about injury (68%), not being fit enough (34%) and being made to look stupid (27%). These are closely followed by a fear of heights, steep slopes and concern about skill level. The Ski Confidence Camp, which is taking place on 24th September, is specifically tailored around the research findings and the needs of nervous skiers, to boost confidence and self-assurance amongst beginners. Hosting the Ski Confidence Camp will be Team GB Paralympian, Menna Fitzpatrick, the twenty-year-old alpine skier who won a total of four medals at the Pyeongchang Winter Paralympic Games earlier this year. The medals included a Bronze, two Silvers and a Gold in the Slalom event with her guide, Jennifer Kehoe. Menna is no stranger to overcoming confidence issues and with just 5% vision, she learned to ski from the age of 5 by following her dad down the slopes on family holidays. She said: “Confidence really is key when it comes to putting on a pair of skis. It takes a lot of courage to get on the slope as it can be a really terrifying prospect! Morwenna Angove, CEO at Chill Factore, commented: “Something that we often experience amongst our beginners is a lack of confidence and self-belief on the slope. Our Ski Confidence Camp is a tailored session that has been crafted to encourage nervous beginners to improve their confidence. The Ski Confidence Camp will take place at Chill Factore during a typically quiet time in the day and be supported by three instructors to give additional one to one time. Additional features of the Confidence Camp include breaking down barriers by attempting sit falls, walking and familiarising yourself with the slope, an introduction to equipment, top tips to beating the nerves and ice breaker activities. The Ski Confidence Camp will take place at 12pm on 24th September and is free of charge to attend. Places are open to beginner level skiers who consider themselves to lack confidence. Availability is limited and on a first come, first serve basis. Book online at www.chillfactore.com.